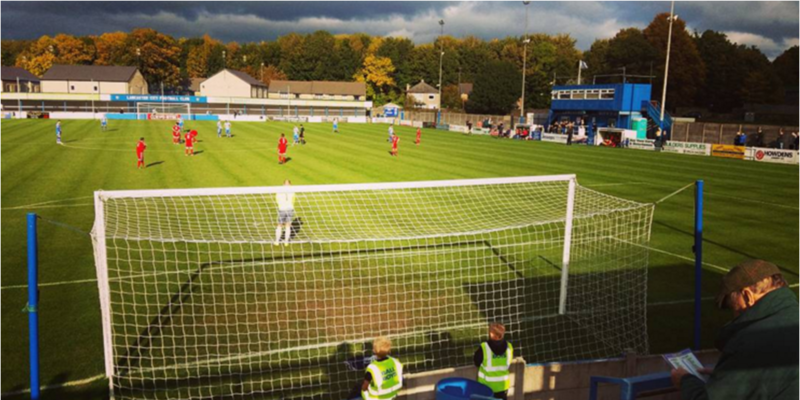 A fair-sized crowd of 162 witnessed an inspired first-half performance from Lancaster City at the Giant Axe stadium, as they eased past opponents Ossett Town on a sunny October Saturday to record their first Evo Stik First Division North victory in nine attempts. There were several changes to the side which faced Trafford in midweek, with the inclusion of centre-back Chris Churchman, a new signing from Stockport County, to make his debut for the club. Meanwhile it was announced that Garry Hunter had been released from his contract, despite the home side only being able to name four substitutes. The game started brightly for Lancaster, who looked confident in possession and played impressive passing football throughout the first half. Playing into the wind, Ossett Town struggled from the offset to deal with the attacking menace of the hosts, with Aaron Taylor and Ryan Winder particularly impressing. There were less than five minutes on the clock when Winder’s through-ball found Aaron Taylor, who beat the offside trap and placed the ball through the outstretched hands of the disappointing Tom Morgan, and into the bottom left hand corner. The early goal gave the hosts confidence, and the visitors barely managed to get the ball past the halfway line in the first half. A dipping Winder volley was parried by Morgan midway through the first half, but eventually the pressure came to fruition. Winder took advantage of a quickly taken free kick from Joe Whittington, and rounded the keeper to convert Lancaster’s second just before half time. After the restart the hosts again came out of the blocks quickly and impressively. Almost immediately Taylor’s neat footwork set up Winder to bury his second goal of the afternoon; the atmosphere lifting dramatically as Lancaster apparently put the game beyond doubt. In trying to prevent the goal, visiting goalkeeper Tom Morgan was injured and forced to withdraw from the field. With no replacement goalkeeper available, Ossett captain Stephen Jeff was forced to take his place in goal. Lancaster thought they had a fourth when a terrific cross from the outstanding Winder was met by Whittington’s back-post diving header, but the midfielder was adjudged to have been offside. With the game apparently wrapped up, Lancaster sat deep for the final 20 minutes, allowing the visitors to dominate possession. They were soon punished though, when Ossett Town were awarded a controversial penalty for a foul on Lucas. Although Mike Hale in the City goal saved Curtis’ initial effort, the follow-up was converted. Deep into the five minutes of injury time, a woeful backpass from the otherwise excellent debutant Churchman was pounced upon by Curtis who rounded the keeper to finish from an extremely tight angle. But it was too little too late for Ossett Town, and the score was ultimately flattering on the visitors. The victory moves local side Lancaster City up to 13th, and certainly on the evidence of this performance, the play-offs can’t be ruled out as a possibility. The club offers students admission for just £4 and the entertainment on offer undoubtedly offers value for money. Next up is a local derby at home to Clitheroe on Tuesday night.